We’ve rolled out a hotfix for the game that contains the new DLC pack: Treasures of Turan, as well as a UI fix when using controllers. Treasures of Turan Pack, Year 2 Season Pass (and a patch for a UI fix) now available! One Question: is there an entry in the Server Settings Ini for the Thrall Decay? I am asking for our private dedicated server. It should now be available through the server settings UI. I hope keys for contest participants will be send soon. Yeah I forgot about that regarding the gallery mention in the stream Myrdhim , but as I have no patience at all and MUST HAVE IT NOW (or at least before the victims that play on my server get it), I threw money at it and got it the moment it landed. what about the dismantling bench dupe ??? this is super important to fix now not dlc. Our team is working on that now. It seems to imply they carry more than the other animals… yet the last statement in the description says its cosmetic only.
" 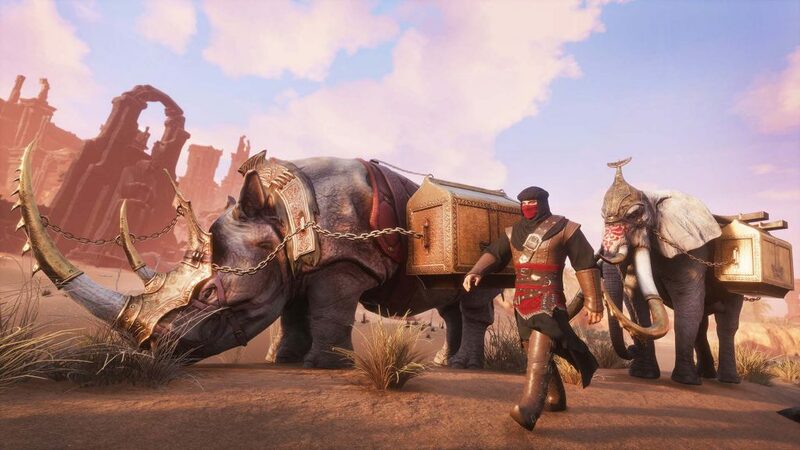 2 new exclusive pack animal pet skins: The richly adorned caravan rhino and elephant"
The skins are only cosmetics and shouldn’t change the carrying capacity of the animals in question It just makes them look more like pack animals. I’ve changed the text in the original announcement to reflect it. Thanks for pointing it out to us! I’m not seeing flawless epic Turanian Mercernary Chestguard to craft. Is this a bug or intended? When we will see this dlc on x box and the fix for not showing up whe are the owner of buildings.